Since Shingeki no Bahamut: Genesis feels the need to recap six episodes, I’ll do a post on Mushishi instead. I wonder if Yui is telling the whole truth. After all, why would her abilities suddenly go away? Remember when a younger Gen first saw the “angel” flying overhead? I keenly recall the his father’s reaction. He rather harshly said to his son, “Don’t talk such nonsense. You’re imagining things. You shouldn’t see things like that.” He then dragged Gen away. What they both didn’t know at the time, however, was that they were looking at Gen’s mother. In other words, the father was inadvertently barring his son from seeing his mother, a terrible yet recurring act. When she gave birth to Gen, she “nearly died as a result.” By the time she woke up, the father had already taken Gen back home. As a result, she didn’t even get to hold her newborn. They often say mothers and newborns should be allowed to bond in those crucial, formative moments. Yui was denied this from the very start. Was this the father’s intention? Again, no, but the results are the same. 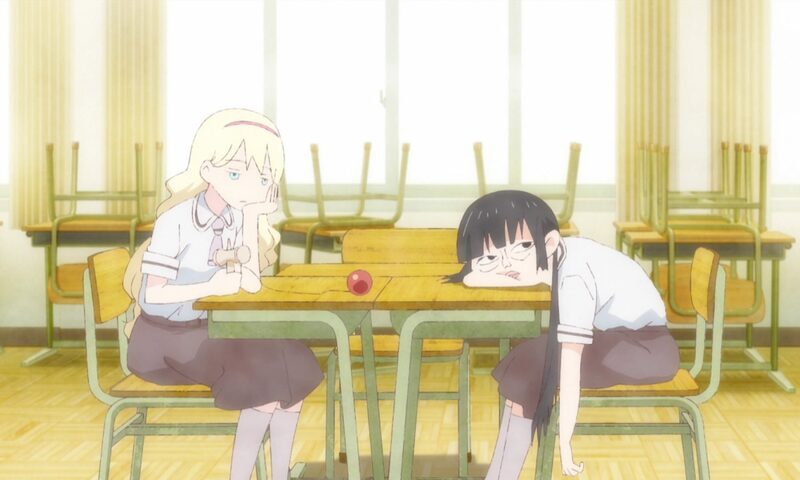 Then when Yui finally recovered her health, she still couldn’t come back home. She was “seeing” things, which was already bad, but then another tragedy struck: she had inadvertently removed ether from Gen, ‘causing the infant to go limp. Likely under the impression that he was just protecting his own son, Yui never got to see Gen again. You get the feeling that the father is a no-nonsense kind of guy. He wants to be as practical and pragmatic as possible. And hey, life was hard back then. You don’t get the luxury to have flights of fancy. His wife, on the other hand, represents the other end of the spectrum. Ever since she gave birth to Gen, she could “see things.” Maybe this was just a sign of our new mother’s newfound appreciation for life. Nevertheless, this new talent of hers disturbed her husband. I wonder if he and others around her attributed her condition to some form of female hysteria. Female hysteria is, of course, no longer considered a medical disorder, but we have to keep in mind what time setting we’re in. During Ginko’s time, it wouldn’t surprise me if this false affliction was considered a very real and serious threat. The father thus took it upon himself to raise Gen by himself, which must’ve been a very difficult. I’m sure the father still had to work long hours, so how much time did he really spend with Gen? How much attention did he really pay to Gen’s physical and emotional upbringing? Being the no-nonsense kind of guy that he is, the father probably saw to it that Gen was well-fed and physically healthy. And of course, he likely tried to instill the same no-nonsense practicality into his own son, especially when Gen started to “see things” like his “crazy mother.” But I doubt the father showed him much sensitivity. What’s even worse is that it seemed as though the father held a grudge all these years against his own wife. Recall his words when he finally gave in and allowed Gen to see the catatonic Yui: “If only I could’ve forgiven her sooner….” That’s just strange, isn’t it? What is there to forgive? Yes, Yui may have caused Gen to go limp back then, but she didn’t know she was doing anything wrong; she had no malicious intent. It was an unfortunate accident, which you’d think a married couple should be able to overcome. 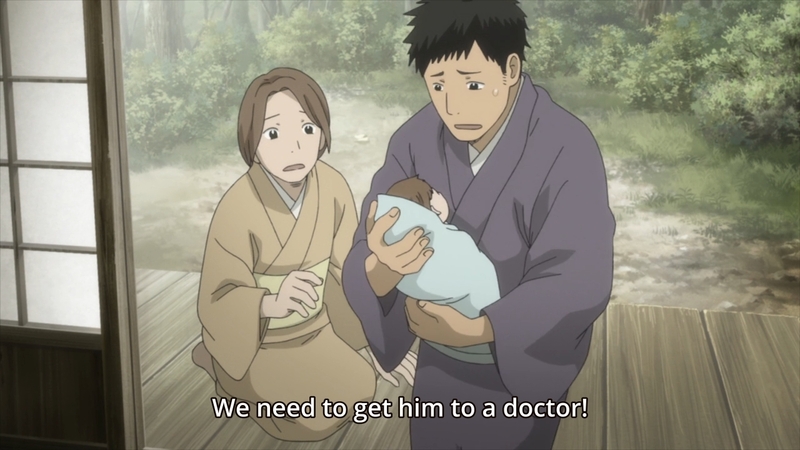 Not only that, after Ginko saw them the first time, the infant Gen recovered his health, so why would the father continue to push your own wife away like this? Why would the father continue to deny Gen from seeing his own mother? 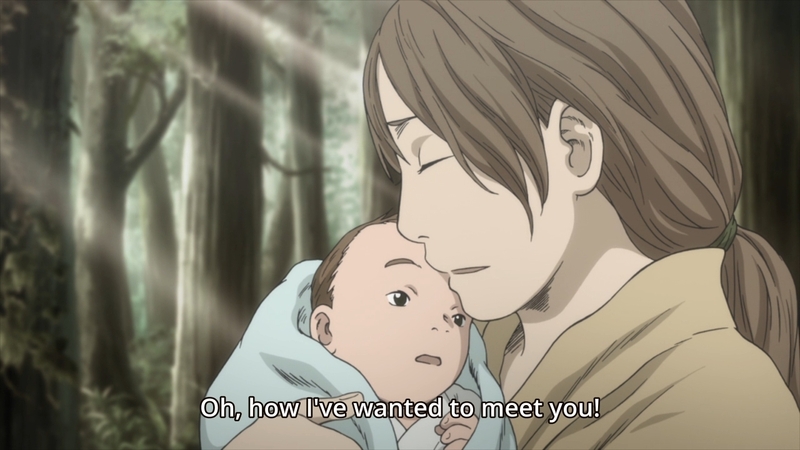 Luckily, in the Mushishi universe, a mother’s love finds a way. As a result, Yui was thus somehow able to dissociate herself from her body and appear as a floating “angel” in the sky. I doubt she remembers doing this, of course. Nevertheless, she was able to see and look over her son. Unfortunately, she couldn’t help raise him. Is it any surprise, then, that Gen grew up to be a hot-tempered boy? After all, kids often act out and have a myriad of issues whenever they have to deal with their parents’ divorce. Gen’s parents didn’t get a divorce, of course, but what he had to live through probably wasn’t much different. In the long run, most people believe that it is better for a child to have two happy but separated parents instead of one unhappy family. That may very well be the case, but it doesn’t change the fact that most kids probably don’t cope with parents’ separation right from the start, especially when they are unable to see one of their parents completely. And that’s what I see in Gen. He lacked his mother’s love, and as a result, he grew up to be an angry and resentful. He may not say it — he may not even know how to articulate it — but he is resentful of his father. But what can a child in his position do? What can he really say to his father? Nothing really. So Gen takes it out on the neighborhood kids. Even in the end, his father only relents because Ginko is there. And on a related note, why do you suppose Ginko’s medicine didn’t work with Gen? It’s because there is really nothing wrong with the kid. Nothing wrong with him that Ginko’s expertise could cure, that is. Gen didn’t have an overdose of ether in him. He just needs his mom, and that’s the saddest truth of all. Then when he finally gets his mother back, Ginko sees the boy happily playing with the neighborhood kids. Ginko saved the boy’s life the first time by putting infant Gen in that robe. But the second time around, the solution turns out to be the simplest one around: let the boy be with his mother. So back to my original question… is Yui telling Ginko the truth? Or has she realized by now that some things are better kept a secret? Her abilities to see the beauty in the world has ironically given her enough pain and sorrow. Unfortunate as it is, she has to hide her unique talent from perhaps everyone but her own son. In the end, I suppose all’s well that ends well. She is reunited with her son, and you can assume that their family will live happily ever after. But I have my doubts about that father…. Who do you think is the best anime of the season Shingeki no Bahamut or Mushishi? I don’t think the father held a grude to his wife. He just afraid for his son because he probably think she’s crazy. This is the old time, so when his wife suddenly see strange thing, he just did’t know what to do. One isolated incident in which the child may have gone limp from her actions — he had no way of knowing if she was really responsible — is not enough in my eyes for the father to treat the mother the way that he did. Again, it’s the olden days, so a baby could fall ill for any reason. Child mortality rates were not exactly ideal back then. To cut Yui off from her son for years was cruel. 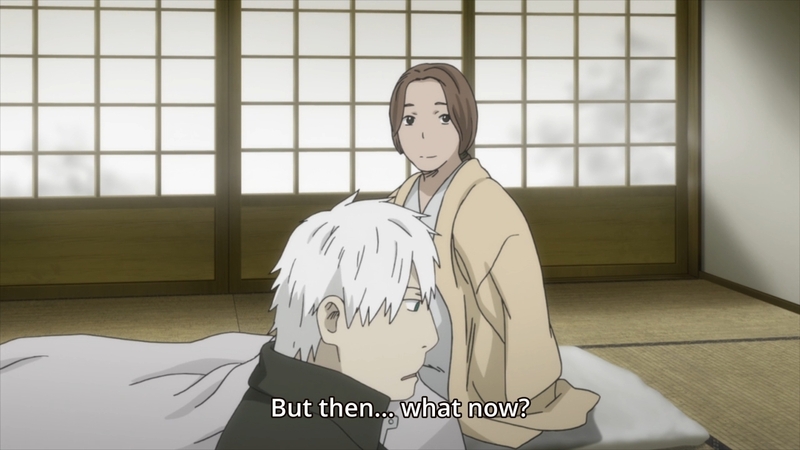 Mushishi is an amazing anime, i can no understand why your reviews of the episodes of mushishi are not popular. Good news, the popularity of your website increased a lot in the last 6 months. Moesucks had 140K views in the last month. Hah, I wish I actually got 140k views a month. It’s certainly possible that the mother decided to lie about her ability at the end. Given how badly her husband dealt with this hidden side of her, it wouldn’t be surprising for her to want to hide it from people now that she was given the chance. In the end, despite the fact that he apologized to her, I find it easy to believe that her husband wouldn’t have been able to handle her problem any better. The episode made it very clear just how bad of a father the guy was. Keeping the child away from the mother at birth and then driving her away were just a result of his distrustful and insensitive nature, which I believe contributed to the kid’s angry behavior just as much as him missing his mother all that time. The episode decided to give us a neatly packed happy ending, but with that kind of father, I find it hard to believe that the ending would really be the end of their problems. Possibly a first step toward fixing their problems, but not the end. Too bad for the lack of Shingeki no Bahamut this week, but sadly it’s not the first time that an anime show falls behind schedule and is forced to skip a week (even less surprising for a highly polished and good looking show like Bahamut). Hopefully they can get things together in time for next week. Or did it? If we noticed something was off, perhaps it was the episode’s subversive message after all. The father was unbearable, I also doubt it’s going to be a happy ending for them all with him around. Gotta say 2 bad fathers in a row left a bad taste. Well, at least the mother and son are finally united. Previous PostPrevious Ookami Shoujo to Kuro Ouji Ep. 7: I wish I knew how to quit you! Next PostNext Fall 2014 Harem Hill, Week 7: Does milady require assistance?